Saint-Affrique is a small town about 80 kilometers south of Rodez, in the Aveyron region of Southern France. It sprang up in the 6th century around the tomb of St. African, Bishop of Comminges, and its possession was often vigorously contested. The key point for Flaugergues is the legend that Joseph of Arimathea took the Holy Grail to Aveyron after Christ's resurrection, where Flaugergues believed it remained to his day. (This piece of lore is also linked to the holy quest of Arthurian legend.) Flaugergues sought by various means to prove this point in his book, however, the only response was a brief notice in the annual report of the League of letters, arts and sciences of Aveyron which, while calling it a "bold assumption [with a] laudable goal," nevertheless considered its findings unsubstantiated, (https://fr.wikipedia.org/wiki/Natalis_Flaugergues). 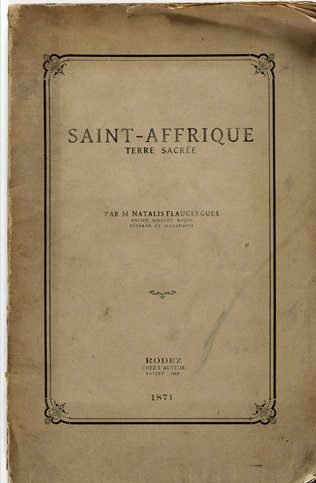 Undetered Flaugergues continued, producing his second book in 1874, in which is elaborated the even bolder thesis that Rodez is the center of the world and the cradle of humanity, its inhabitants being the post-Edenic ancestors of all the peoples of the Earth, and its dialect, Rouergat, the Ur tongue from which all (non-divine) languages derive. Here is the source of Flaugergues's fascination for later scholars, for like many fou, his research methods are mainly etymological and philological, rather than what we would today regard as strictly historical. (It must be remembered however, that in the 19th century philology was widely considered a profound and serious source of historical knowledge.) In support of his own argument, Flaugergues cites the scholar Jacques Le Brigant who, in The Primary Language Preserved, argued that both Chinese and Sanskrit, as well as the languages of the Caribbean and Tahiti, all have their roots in Celtic; and Francisque Michel, who in 1857 proclaimed Basque the origin of all Semitic languages. Alongside the philological arguments, Flaugergues also analysed local place-names to support his points. For example, according to Flaugergues, the name of the hamlet of Vailhauzy, part of the municipality of Saint-Affrique, takes its name from a deformation veille aussi (Eve too!). Something similar can be said for the name of another village, Monhargues, allegedly derived from Monarque. In Flaugergues’s analysis both place names allude to the divine status of Christ, and demonstrate an indexical link between the region and His divine presence. The world is the pedestal. [...] The silence accompanying the publication of this second volume seems to have been total," (https://fr.wikipedia.org/wiki/Natalis_Flaugergues). 3)- a sense that what is revealed in language has the status of a compelling "truth” whose reality is independent of the tongue in which it is uttered. All these are complete anathema to standard contemporary theories of language and, as we shall see, precisely because of this, fou texts can, and indeed have become the core pre-texts for the development of a wholly different theory of language, as well as a vastly different way of understanding the relations between language and other aspects of the world, including thought, the body, and dare I say it, the "subject.